Let's talk bookshelves. Both practically and impractically. 1. Keep them in your fireplace. 2. Make your own Little Free Library. 4. Put them in a birdcage. 5. Build shelves as high as they will go. 8. Convert your bedroom door into bookshelves. 9. Turn your pantry into a bookshelf. 10. Staircases make great places for bookshelves. There's all that dead space! 11. Stack them on your stairs. 12. Turn them into stairs. Might take some carpentry skills, but totally worth it. As seen at John W. Doull Books in Dartsmouth, Nova Scotia, Canada. 14. Make an arch or doorway. So you can walk in and out of books for the rest of your life. 15. Replace your closet with books. Clothes — who needs 'em?? Put a nook in there. 16. Make good use of your corners. 17. 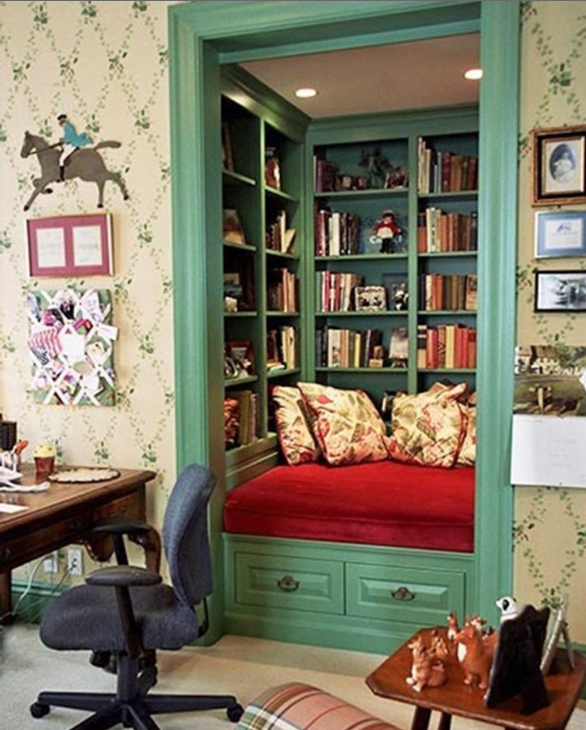 Build a book cave. 18. Or a book igloo. 19. Or a book shed. 20. 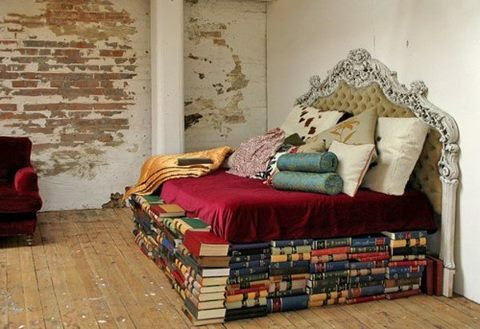 Or a book throne. 21. Keep the sunlight out with impromptu book window shades. 22. Make a kitchen island out of them. 23. Strap them to the back of any inanimate object. 24. Suspend them from the ceiling for the most epic mobile ever. 25. Recreate a still life. 28. Block the door with them for the utmost in home security. No one is ever getting in. 29. Stack 'em in the corner. Books are the only things that don't create clutter. They look great however, wherever, they are. 32. On top of a table. Agatha Christie, you're doing it right. 34. Let them hold your tea mug. 35. Stack them tall and proud.